Revelstoke Mountain Resort looks for individuals who are courageous, compassionate, and competitive; thrive on positive, frequent customer contact; have an adventurous spirit and are enthusiastic, sincere, and fun loving. Revelstoke Mountain Resort fosters a work environment where diversity is valued, quality of life is enhanced and individual aspirations are fulfilled. APPLICATION TIP: GET YOUR FOOT IN THE DOOR. GET HIRED FOR THE SUMMER AND STAY ON FOR THE WINTER. Email Application » Permalink This is a Full Time position. The mountain safety team summer patrol administers first aid to injured guests/staff, monitors and maintains the safe conditions of runs/trails, is able to take on a leadership role during day to day operations, lift evacuations and search and rescue operations under the supervision of the Mountain Safety Supervisor and the Slopes Manager. Email Application » Permalink This is a Full Time Seasonal position. This is a continuing year-round position that varies depending on the season. As a Custodian Team Leader, you’ll be proficient with all aspects of the Custodial Department and able to lead a team of Custodians. *This position’s wage includes a $2.00/hr retention bonus paid out in full at the end of the summer operating season. Full time seasonal positions beginning mid-May through to mid-October with the potential to continue on with a year round position. As an Access Control Supervisor you are responsible for overseeing ticket checking at the lifts and various attractions, supervising a staff of approximately 6 to 8. *This Position’s wage includes a $2.00 /hr. retention bonus paid out in full at the end of the summer operating season. Full time and part-time seasonal positions beginning in the middle of May and middle of June through to Labour Day or middle of October making this an ideal student job. As an Access Control Agent you are responsible for accurate ticket checking at the lifts and various attractions including managing time slots or numbers for certain activities. If you’re interested in spending your summer hanging out in the mountains enjoying beautiful views and chatting with travelers, this might be the right fit for you! Gondola Attendants are responsible for the safe loading and unloading of guests and efficient operation of the lift. This team has a key role in exceeding guest service expectations by creating a friendly and positive atmosphere with a focus on safety. This position runs from June 22nd – September. Provide guests with general resort and town information, communicating with guests is a huge part of this job! Excellent communication skills, Ability to communicate clearly over a radio. Multilingual and first aid skills an asset. Oversee the maintenance program of the heavy equipment fleet at Revelstoke Mountain Resort. Delegate and perform all needed maintenance activities for all heavy equipment fleet aspects of the resort, as required. Maintain records of all maintenance activity. Run a clean and professional shop. Assist with development of the annual maintenance budget. Ensure staffing meets operational needs while keeping within payroll budget. Conduct formal performance evaluations for vehicle maintenance staff. Ensure that all related activities are conducted in a safe manner through sound judgment and knowledge of safety procedures and guidelines. Must have Grade 12 Diploma or equivalent. Journeyman Heavy Duty Mechanic – BC Trades Certification, Interprovincial Red Seal Trades Certification or international equivalent. A minimum of 8 years related experience - electrical experience preferred. Must be able to work in potentially hazardous environment with exposure to variety of physical conditions such as proximity to moving mechanical parts and electrical current. Revelstoke Mountain Resort is committed to providing our guests with highest level of service and product presentation. Custodians are responsible for the cleanliness of all public areas throughout the resort. This is a full time position from May 17th through to October and could continue into winter employment for the right candidates. Assist with the maintenance of snow cats and fleet equipment. Oversee the maintenance program of heavy fleet equipment. Perform all needed maintenance activities for all heavy equipment fleet aspects of the resort, as required. Maintain records of all maintenance activity sound judgment and knowledge of safety procedures and guidelines. This is a full time seasonal position from early June through late September with potential to be full-time year round. The rental shop supervisor is responsible for the effective and efficient operations of both the rental and and the mechanic shops. This will include but not limited to hiring, training and scheduling of staff to ensure a world class level of service and product is delivered. Full time seasonal positions beginning mid-May through to late September with the potential to continue on with a year round position. Guest Services Agents continually strive to provide our guest with the ultimate resort experience. You are expected to market the Resort’s products, services, programs, benefits and qualities of Revelstoke Mountain Resort to our guests. This is a full time seasonal position from July through to mid-September. The Rental Shop Associate is a front line position helping guests with the rental process and sharing your passion for mountain biking. This is a full time seasonal position from late June through to late September. As a bike mechanic you will be responsible for the assembly, maintenance and repair of both our guest’s and rental fleet bikes. Assisting guests in the retail store and with bike rentals maybe required at times. Email Application » Permalink This is a Part Time Seasonal position. The primary role of the Guest Services Assistant Manager is to coordinate the day to day operations of the guest services department and ensure the best guest experience possible. The Guest Services Assistant Manager will coach and mentor the guest services team to ensure the highest level of service for RMR’s guests while developing the skills of guest services’ team members. This position will be responsible for seasonal updates and administration of the RTP point of sale system. Excellent problem solving skills with a “can do” attitude. Count, verify, and deposit all cash and cheques on a daily basis. Process change requests and maintain an adequate level of change in the safe. Maintain an accurate float inventory for all Point of Sale locations at RMR. Develop, implement and maintain cash room standards and procedures. Oversee auditing of daily register activity. Audit and resolve credit card dispute claims in a timely manner. Ensure the confidentiality and security of all financial documents. Prepare, verify, and process invoice payments. Ensure AR transactions are processed accurately and charged accordingly. Completion of post-secondary courses in Accounting leading towards a certificate in accounting, or an appropriate and equivalent combination of education, experience and training. Knowledge of bookkeeping and general office procedures. Knowledge and/or experience with RTP and Quickbooks would be a definite asset. Ability to maintain a high level of accuracy when entering and preparing financial documents. High level of accuracy and analytical skills with attention to detail. Ability to meet deadlines and to work autonomously and as part of a team. The Sales Associate will be responsible for assisting guests with product selection, completing sales and general retail operations. This is a full or part time seasonal position beginning mid-May through to late September with the potential to continue into year round employment. The Retail Associate continually strives to provide our guests with the ultimate experience. Rope Runner’s are RMR’s Aerial Park guides, leading groups of 20 guests throughout our technical ropes course. This is a great job for those looking to be outside and active at work. You’ll be required to climb ropes and obstacles 4 stories tall in all weather conditions and maintain a constant detailed approach to safety. There are part-time and full-time shifts available from June to October. Must have a passion for the outdoors and the ability to work in all weather conditions. As a Mountain Coaster Team Leader, you’ll be proficient with all aspects of operating the Mountain Coaster and able to lead a team of Coaster Attendants. Email Application » Permalink This is a Seasonal position. If you are looking for an outdoor team-based job this summer, being a Mountain Coaster Attendant is it! Coaster attendants are responsible for the safe operation of the gondola and the Mountain Coaster. There are part-time, full-time, morning and evening shifts available. This position runs from May 13th – October. A second round of hiring will also take place for peak season positions running June 22nd – September. First aid skills an asset. This is a great option for those interested in working with kids and spending the majority of the day chatting with guests. Bungee Bounce Attendants are responsible for the safe operation of our Bungee Trampoline and validation of ride tickets. There are full time and part time positions running from June 22nd – September. Set up and take down the ride equipment such as poles, ropes, tents, signs and bungees! Control the flow of passengers using the Bungee Bounce and regulate ride duration. Email Application » Permalink This is a Temporary position. Provide all areas of the restaurant with clean, sanitized dishware on a timely basis. ​All Food & Beverage outlets at Revelstoke Mountain Resort are looking for dynamic individuals to fill seasonal and year-round positions. If you want to grow your hospitality experience with one of Canada’s Leading Hospitality Companies we want to talk to you! The Banquet Captain works directly with the Banquet Manager and Banquet Coordinator to create memorable experiences with attentive service, product knowledge, fun and passion. He or she acts as shift leader. This is an introductory management position. We are accepting both seasonal and year round applicants for Banquet Captain. Produce all assigned menu items in an efficient and consistent manner while following the specifications, recipes, and techniques of the company. Bussers clear, clean and reset dirty tables, and assist with general cleaning & maintenance of the Lodge while maintaining a cooperative, positive attitude towards guests and fellow staff. Cashiers provide our guests with efficient and friendly food and beverage service while following the policies and procedures of the company. Front Desk Agents are responsible for greeting and registering guests, providing outstanding guest service and settling the guest’s account upon completion of their stay. Other duties will include registering guests, making and modifying reservations. The Hotel Front Desk Clerk must possess a positive and upbeat personality with a desire to deliver outstanding customer service to our guests. The Hotel Front Desk Clerk must have the ability to multi-task, be detail-oriented, and be able to problem solve in order to effectively deal with internal and external customers. • Present statements of charges to departing guests and receive payment. • Take over from the previous shifts cashier, checking and accepting float and takings. • Work closely and professionally with various departments. The Maintenance Worker will be responsible for performing general building and property maintenance. The successful applicant must have good communication skills, be service oriented, good at planning and organizing work, critical thinking, a team worker and responsible and accountable for own job performance. • Comply with Health and Safety and WHMIS requirements for Personal Protective Equipment. • Respond to client requests for maintenance in hotel rooms. • Perform regular property inspections of the hotel including common areas, building exterior, and landscape. • Clean light fixtures and change light bulbs/tubes. • Perform minor repairs on windows, doors, switches, desks, tables, plugs, equipment, appliances, sinks, toilets, blinds etc. • Responsible for vandalism clean up and repair, within skill level. • Maintain heating and air conditioning systems, perform routine checks of boilers, pumps, fan units, control panels, thermostats, cooling towers, etc. • Maintain outside grounds (remove snow, ice, and debris, spray and remove weeds, sweep and clean gutters, water and maintain sprinkling systems). • Detect faulty operations, defective material and report those and any unusual situations to proper supervisor. • Perform all other duties as assigned or needed. • Minimum 1 year of experience in the operation and maintenance of buildings. • Ability to perform small repairs (e.g. caulking, replacing washers, and replacing light fixtures, waterproofing and tiling). The Sutton Place Hotel Revelstoke is committed to providing our guests with the highest level of service and product presentation. Room Attendants are responsible for the cleanliness of guest suites and public areas. Duties includes but are not limited to linen changes, making beds, sweeping, mopping, vacuuming, dusting, cleaning windows, cleaning washrooms, stocking linen closets and supply areas. Hours of this position are Monday to Sunday with various start times depending upon hotel occupancy. Must be able to lift at least 25 pounds, in good health, and capable of working in a physically demanding job. The Sutton Place Hotel at Revelstoke Mountain Resort is looking for dynamic individuals to join our team of hospitality professionals. We are currently looking to fill a few positions in our Laundry Department. The Sutton Place Hotel Revelstoke is committed to providing our guests with highest level of service and product presentation. The Sutton Place Hotel Revelstoke is recruiting Seasonal Concierge Personnel. Duties include assisting with arrivals and departures, providing outstanding guest service that meets and exceeds guest expectations. Concierge must possess a positive and upbeat personality, have the ability to multi-task, be detail-oriented and be able to problem solve. Work closely and professionally with various departments. Q: When do seasonal employment positions start? Our winter season kicks off in November with a closing date in April. Our summer season begins in May and runs until October. Start dates vary according to the position applied for, but typically begin one week prior to seasonal operations. Q: Does Revelstoke Mountain Resort offer staff accommodation? Revelstoke Mountain Resort does not offer staff accommodation at this time. The town of Revelstoke offers a variety of accommodation options. Please make a rental application at Revelstoke Property Services or view private rental listings on The Stoke List classifieds. Q: I am not from Canada. 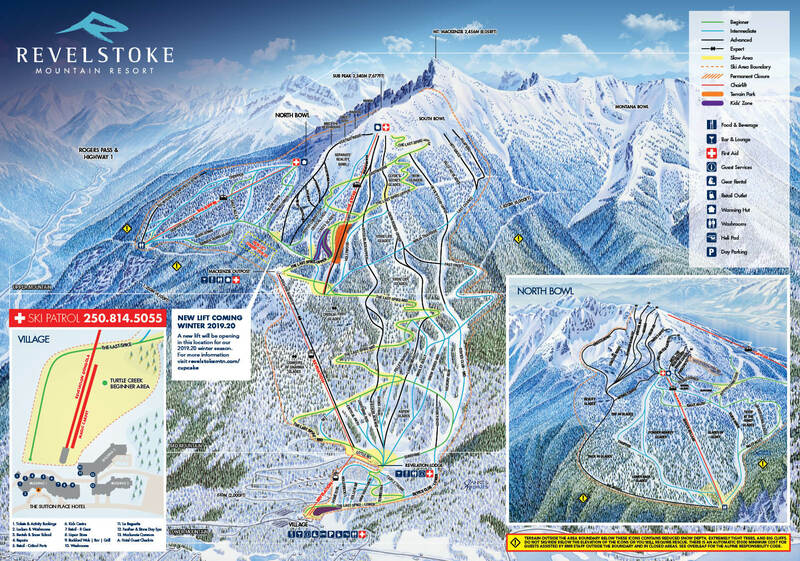 What do I need to do to work at Revelstoke Mountain Resort? Q: I am not from Canada. How do I obtain a work permit? To apply for your Canadian Work Permit, you must contact the Canadian Embassy or Consulate in your country. Please remember that the application process can take several months. Q: I am applying for my work permit and have been told that I need a letter of offer to obtain the permit. Can Revelstoke Mountain Resort do this for me? Revelstoke Mountain Resort cannot give letters of offer to foreign workers who require such an offer to apply for their permit to come to Canada. You must apply for a Working Holiday Permit visa. This permit/visa does not require you to have arranged employment before entering Canada. Q: Does Revelstoke Mountain Resort sponsor people? At present, Revelstoke Mountain Resort does not offer sponsorships. You are required to obtain a work permit yourself for all occupations.